Religion in a communist country like China is much more regulated than most people realize. The central government in Beijing has been weary of religion being used to question their authority and create discord in its various far flung regions. Xinjiang, the home of the Muslim Uighurs is one such (vast) region in the North-West of China. The Chinese authorities are openly fighting their own “war on terrorism” with open police action and propaganda/information warfare directed at foreign and domestic entities. 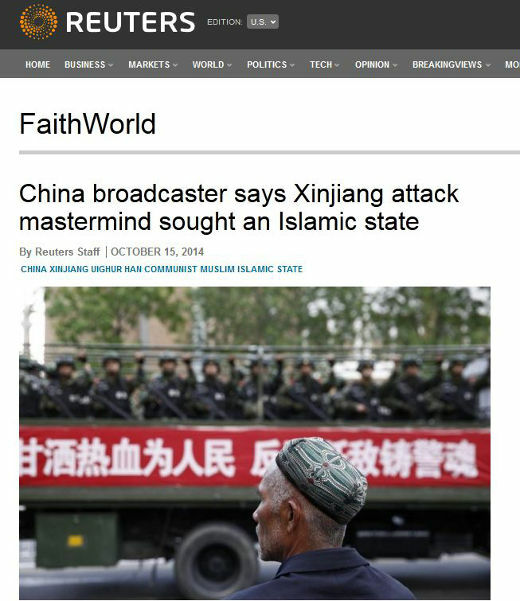 They have used the rise of ISIS/ISIL as a rallying cry to root out Islamic terrorism in Xinjiang, claiming that hundreds of ethnic Uighurs have traveled to the middle-east to wage jihad for the Islamic Caliphate. Justine Drennan, writing for the CFR’s Foreign Policy magazine, looks at the Chinese policies and their potential consequences to its domestic security situation. 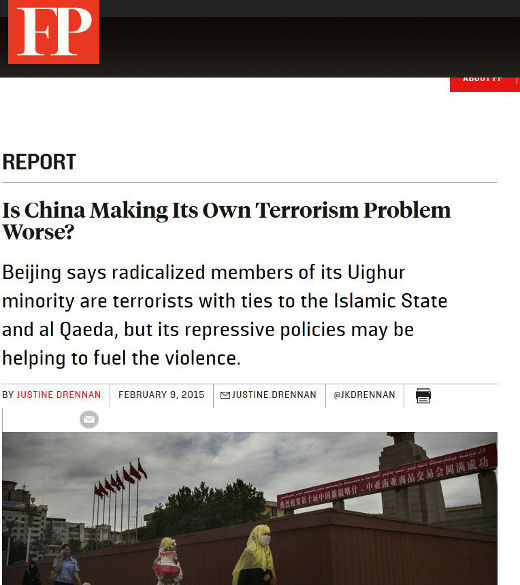 “The general consensus, according to Georgetown professor James Millward, is that radicalized Uighur expats, who mostly seem to be based in Pakistan rather than Iraq and Syria, haven’t provided any operational support for recent violence in China, but rather just propaganda. And any who are fighting with Middle Eastern jihadi groups don’t seem to be rising very high in their ranks, said Raffaello Pantucci, an analyst at London’s Royal United Services Institute. One would think that the last thing people would worry about in an authoritarian communist country like China would be the loss of human rights. But things have been changing in the PRC as liberalization of the Chinese economy, a growing middle class and the communications revolution have resulted in much greater freedom, wealth, property and legal rights. The Chinese government may be looking to curb some of these freedoms by playing the Islamic terrorism card, from its frontier area of Xinjiang, to pass tough new counter-terrorism laws. Human Rights Watch issued a press release warning against the possibility that these measures may do more than fight terrorism. 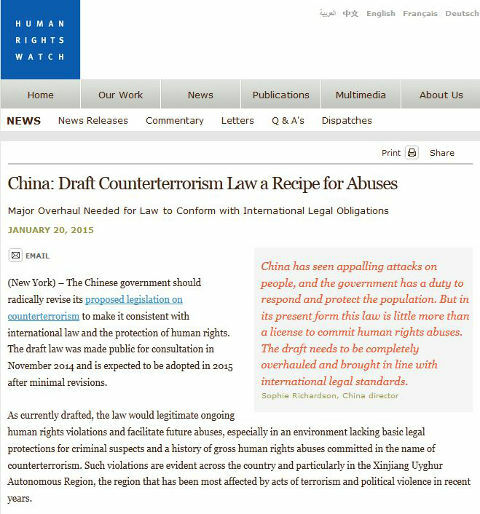 The very vague definition of terrorism, expansion of state surveillance powers to enforce complete digital surveillance and targeting NGOs will harm the human rights of Chinese citizens. China’s use of this concept of “never let a crisis go to waste” is by no means unique to them. Even liberal western democracies that would consider themselves the bastions of freedom have used terrorist acts to bring restrictive laws in place. The USA Patriot Act may be the most well known and even though it has seen some opposition, the law has been in place for over 13 years. Canada, United Kingdom, Australia, New Zealand, Belgium, etc. have all used the Islamic terror threat to beef up their counter-terrorism laws and security infrastructure. HRW may have issued similar press releases in these cases but we are not sure how persistent or effective they have been in preserving the human rights and freedoms of all people. China’s western most Xinjiang province is the gateway to the new Silk Road and is also believed to be rich in many natural resources. With sustained migration from other parts of China and the stationing of People’s Liberation Army troops, the previous majority of Uighur Turkic who follow the Islamic religion, are now believed to be a minority. There is a pretty long history of unrest in the region as the central government has tried to consolidate its control over this vast region. Uighur terrorists have struck at both home (within Xinjiang) and other parts of China (including Tiananmen Square in Beijing) with increasing ferocity. The response from the Chinese government has typically been brutal and swift with tight controls on what information it lets out. A mastermind of violence in China’s Xinjiang region in which almost 100 people were killed sought to establish an Islamic state, official media said on Wednesday, reinforcing government warnings about an Islamist threat. A court in the far western region sentenced 12 people to death on Monday for an attack in Xinjiang’s southern Yarkant county on July 28, in which the government said 59 “terrorists” were gunned down by security forces, while 37 civilians were killed. The incident was one of the bloodiest bouts of unrest in the region that has seen hundreds of people killed in the past two years, most in clashes between ethnic Uighur Muslim people, who call Xinjiang home, and ethnic majority Han Chinese.